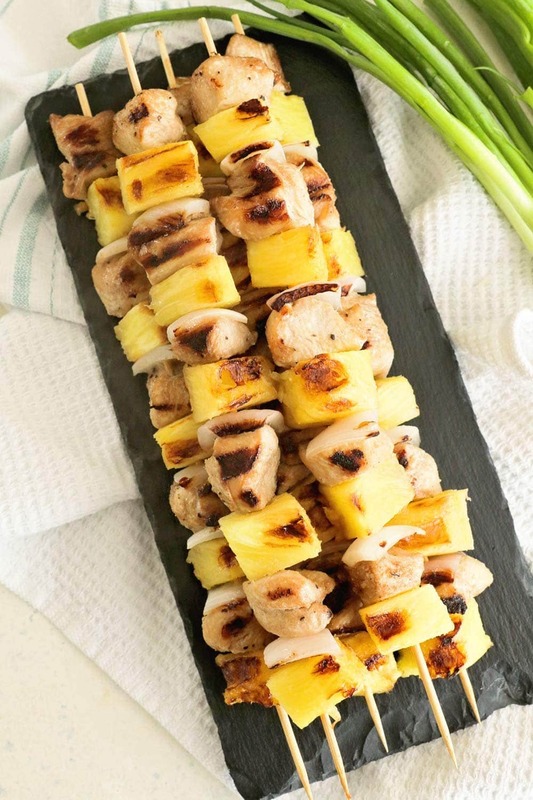 Chicken Pineapple Kebabs ~ Quick and Easy Marinated Skewers that are the Perfect Combination of Sweet and Tangy! Before this summer I had never turned our grill on. It was left to the hubs to do that “manly” thing and grill whenever he wanted to and I loved that he was in charge of the main dish even though I still had to prep it and get the side dishes ready. It gave me a bit of a break. Turns out this really didn’t work because I quickly learned I was not getting much grilled food in the summer and I totally adore it. So I finally broke down and figured out how to use the darn thing. I know, I know it’s really not that hard considering we have a gas grill! I still don’t use it as much as I should but I’ve started to grow accustomed to it and I figure I’ll use it more and more as I find new recipes I love for it! 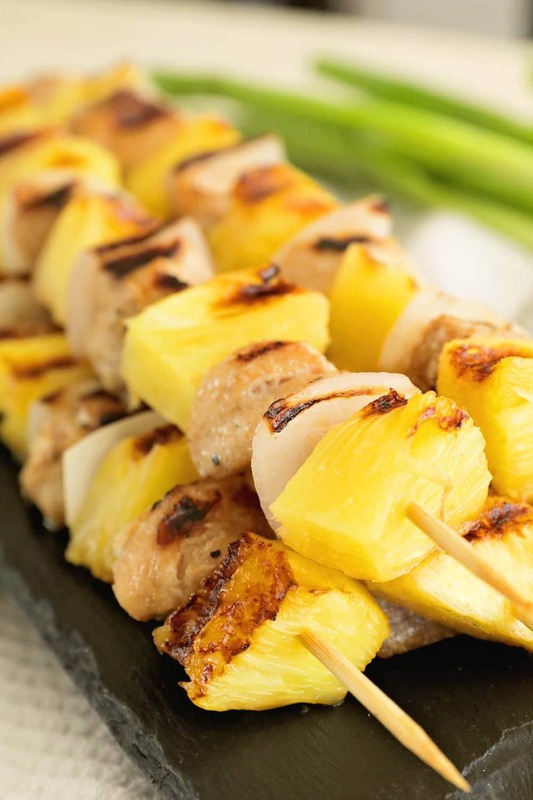 These amazing Pineapple Chicken Kabobs are loaded with chicken, onions and pineapple. The chicken is marinated in a tangy marinade that will have you craving more! Can we talk about pineapple on the grill? WOW. Have you ever had it? It’s has changed my life. I’m a pineapple lover in the first place but grilling it takes it to a whole new level. It’s so sweet and perfect. I was happy to takes the hub’s pineapple that he didn’t want off his hands. Who doesn’t like pineapple? He’s weird, but his loss is my gain in this instance! Miss K and Ry Ry even loved these which always surprises me a little. In fact Ry was stealing everyone’s onions! That girl love onions and it kills me. Miss K was more about the chicken and gladly handed the pineapple and onions over to her sister. In fact I loved the pineapple on the grill so much that I had to text my pineapple loving coworker immediately and tell her to try it if she hadn’t. She hadn’t so I’m waiting for her report on how amazing it is! We always have to order pineapple on our pizza when we go out for pizza. Her hubs isn’t a fan either so that’s the only time we get it! She mentioned that peaches are amazing on the grill to and now I can’t wait to try those. I bet they are perfectly sweet and amazing too! 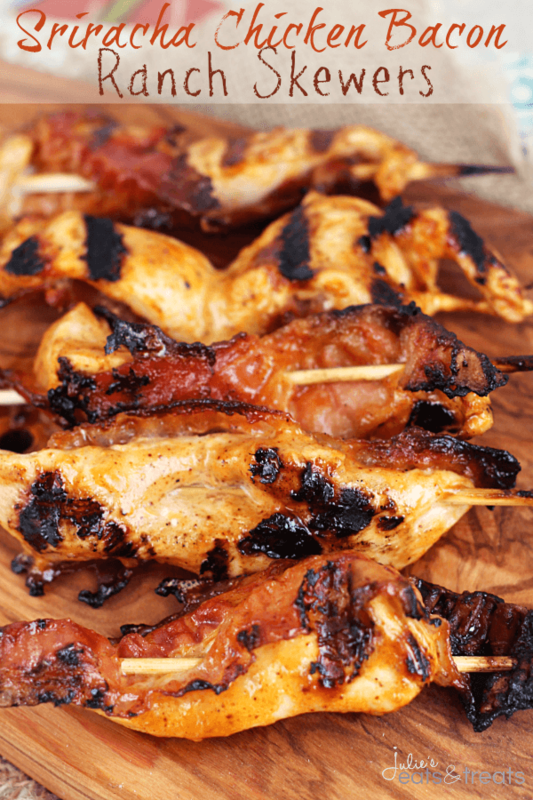 If you are looking for a new way to mix up your traditional fare on the grill this is it! I always feel a little fancier eating kebabs than a burger for dinner for some reason, but they aren’t hard so don’t be intimidated. The main this is to plan ahead a bit so you can marinate your chicken and soak your skewers if you are using wooden ones! Make sure you serve a side of this amazing potato salad with it! Quick and Easy Marinated Skewers that are the Perfect Combination of Sweet and Tangy! Cut chicken breasts into 2 inch pieces. Combine the garlic powder, brown sugar, ground ginger, black pepper, oil, water and soy sauce in a medium size bowl. Whisk until combined. Toss chicken in mixture until coated. Place in the refrigerator for 3 to 4 hours to marinate. Cut the pineapple into 2 inch pieces. Slice red onion so you have slices about 1 inch long and wide. 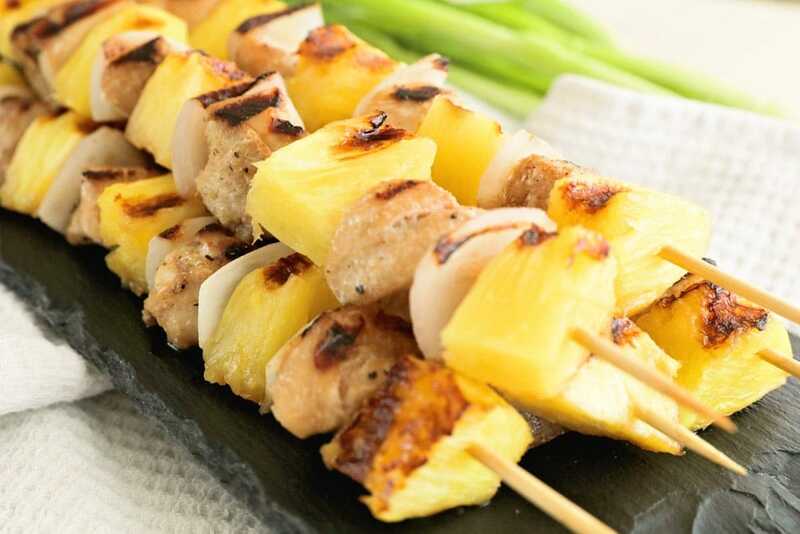 Place chicken, pineapple and onions on metal skewer or wood skewer, that has been soaked in water, alternating pieces. Spray Pam Grilling Spray on grill according to directions. Place skewers on grill. Turn grill on to medium high heat and cook 10-15 minutes or until chicken is done, rotating several times. Looking for more ways to warm up the grill? Balsamic Steak Skewers ~ Tender Steak Marinated in a Tangy Balsamic Vinaigrette and Grilled to Perfection! Sriracha Chicken Bacon Ranch Skewers ~ Chicken Marinated in Bacon Ranch and Kicked up with Sriracha then Grilled on Skewers with Bacon! Omg I love your comment ! My Husband is the same way ! Boring picky eater and the rest of us are not , so we will enjoy these too ! Perfect combination of flavors, so glad you got the grill going for these! Thanks Matt! Love this flavor combo! Love this tropical kabob! Perfect for summer grilling! Great tip! Glad you enjoyed them Christine! Will be checking out if the supermarket here sells it. Nice tip! Thanks for sharing ! Is there a way to cook these inside? I just found your recipe and it looks perfect for my winter buffet. I live in New England. No chance of outdoor grilling in our winter. I’m so excited for grilling season and THESE!!! Hi Mia! This recipe hasn’t changed since I posted it many years ago! Sorry! Thank you very much. Wonderful recipe!!! So glad you enjoyed it Kate! So glad you enjoy them Caitlin!